Another series of Russian provocations involving the Baltic states, related to the Ukraine war, makes so-called hybrid war scenario more and more realistic within the region of the Baltic Sea. The incidents that took place so far, such as the Internet existence of “People’s Republic of Vilnius” or the hooligan attacks on the Polish Embassy in Vilnius, seem to suggest that the Kremlin is going to use the Polish minority of Lithuania, along with the tough history of the Polish-Lithuanian relations, as the basis for its activities, aim of which would be to destabilize the region. The key issue in the above-described problem is the Russian impact on the structures of the Electoral Action of Poles in Lithuania (Akcja Wyborcza Polaków na Litwie, a.k.a AWPL), including the issue of the leader of that initiative. This is even more concerning due to the fact that lately, that group is being transformed into a national political party, in line with the general understanding of that term (before, it had been treated as an organization driven by the ethnic minority). Unfortunately, strict cooperation with the Russian minority is the main measure used here, which may be used by Moscow to realize its own goals. Such option is also suggested by the Lithuanian services and politicians, however, their statements should be treated, for obvious reasons, carefully (ex-Prime Minister Andrius Kubilius claims that AWPL leadership is directly in contact with the Russian Officials, thanks to their regular trips to Moscow. 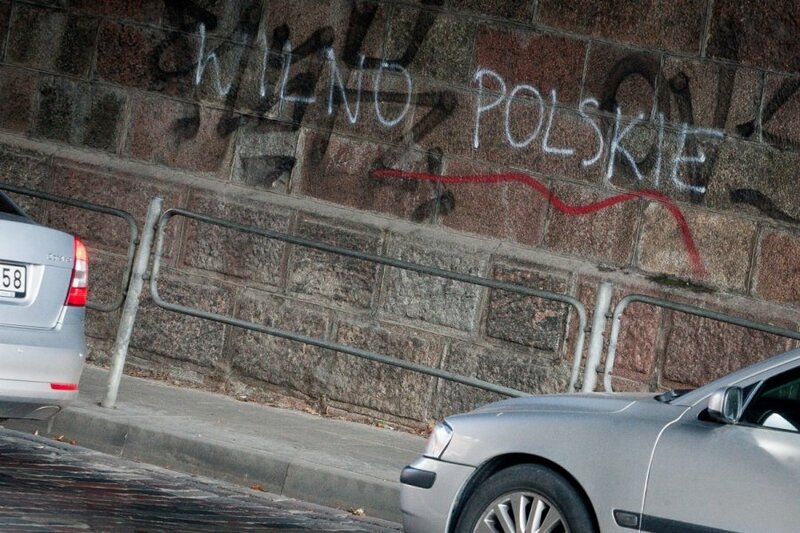 Waldemar Tomaszewski, who is the leader of the Polish minority admitted that indeed, he visited the city, but privately – due to the therapy of his son). The actual, verified activity of the members of the AWPL party is far more concerning than the information provided by the Lithuanian Government. Many of the AWPL members endorse the Russian narrative (e.g. MP Zbiniew Jedziński, who wanted NATO to conduct air-strikes on Kiev). Waldemar Tomaszewski, who is the leader of AWPL, is also the leader who is driving those “concerning” activities. Lately he was criticizing the Maidan protests, compared the annexation of Crimea to the case of Kosovo, and was walking around in public with so called George’s Ribbon. His cooperation with the Baltic World magazine, with the Russian speaking minority of the Baltic states being the target audience, has also been a subject of media attention. This magazine is being led by Dmitriy Kondrashov, who is closely tied to inter alia the Regnum agency, founder of which, Modest Kolerov, who is a friend of Vladimir Putin, is involved in providing support e.g. for the Polish Eurasian citizens. And this is not the only person in the Tomaszewski’s circle, who is connected with the Kremlin. Viktor Balakin, ex-KGB major, is an assistant of the AWPL leader in the European Parliament. Currently his place has been taken by Romualda Poshevieckaya, ex-journalist of the Post-Kremlin TV station, Perviy Baltiyskiy Kanal (First Baltic Channel). Number of the suspicious activists who are trying to get into the Vilnius City Council, who are to be elected from a joint list of the AWPL and Russian Alliance, is also very concerning. The roots of the former group may be traced back to the ex-Socialist Party, which may be actually considered to be a continuation of the ex-communist party, tailored to the new legal conditions and context. The latter group is derived from the Socialist People’s Front (SPF; Lithuanian: Socialistinis liaudies frontas), led by Algirdas Paleckis, who is also closely tied to the Kremlin authorities. Paleckis denies the Russian commandos involvement in the events that took place on 13th January 1991. When one analyses the information above, it is hard to say whether the stance of the AWPL leader and the activists of that organization can be interpreted as a clever political strategy, aim of which is to cooperate with the Russian authorities, or as actions which are derived from the Kremlin-driven inspiration. However, all of that paints a worrying picture, if we take the increasing pressure of Russia on the Baltic states into account. It is easy to imagine a situation in which the Lithuanian Poles may play a key role. After the annexation of Crimea, more and more exotic scenarios could be considered, including scenarios in which Vilnius minority, which has been fighting for its autonomy for years, receives help from the units equipped with the Polish equipment, but without any markings on the uniforms, coming from the Kaliningrad Oblast. Such scenario would become a perfect aim for the Russian Propaganda, which, as it happened in case of the Internet-based People’s Republic of Vilnius, would quickly utilize symbols such as Żeligowski's Mutiny. This is why Lithuania is getting prepared for the worst. At the end of December, the Lithuanian Parliament has adopted a bill, aim of which would be to make it possible to use military force in the peacetime, should a threat to the national security occur (this mechanism is specifically tailored to target the “little green men”). In February this year a decision has been made in Vilnius to raise the terrorist threat level by one step, from the “lowest” to “low”, which means that even if the terrorist acts are not probable, they are possible. What is more, Lithuania has also started “Cooperation 2015” exercise, involving 1800 soldiers. This exercise is to check, whether the Lithuanian military would be capable of acting against threats related to so called “hybrid warfare”. The situation outlined in the present article constitutes a serious test for the Polish-Lithuanian relations, which have not been in the best shape lately anyway. Warsaw, which supports the Polish minority in Lithuania, in the new geo-political landscape, needs to listen to Vilnius more closely (particularly focusing on solving the problems of the mutual relationship on the basis of bilateral talks, instead of using complaints submitted to the international institutions, which could be in turn used by the Russian propagandists). It should be added that Warsaw should do it for its own good – since the current policy pursued by the AWPL authorities is far from being compliant with the Polish interest. Using the ethnic minorities in the countries which depend on Moscow has been a long-lived tradition pursued by the Kremlin. Such idea has been the basis for leaving some Poles in Lithuania. We should be aware of that, particularly due to the fact that Russia was already using the Polish community living in the Vilnius area in a spectacular way, during the ongoing dissolution of the Soviet Union, which happened more than 2 decades ago. No changes could have been noted since then – Moscow still has an impact on our fellow Poles, thanks to the media and the tight net tied around the AWPL political leadership.